Katie Derham with music from the BBC Philharmonic. Mozart: Symphony No 39. Dvorak: Symphony No 8. HK Gruber: Zeitstimmung. Tchaikovsky: Romeo and Juliet Fantasy Overture. 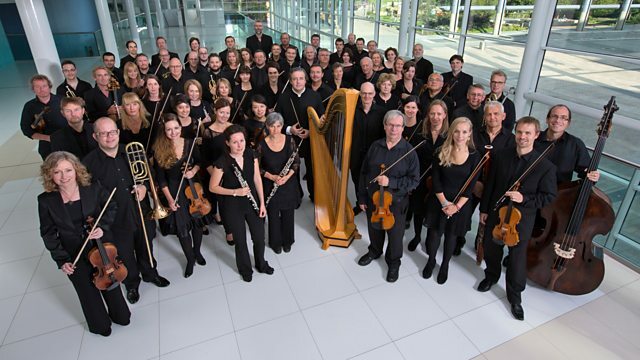 Katie Derham continues a week of performances by the BBC Philharmonic. Today's programme includes a performance of Dvorak's Eighth Symphony conducted by Gunter Herbig, recorded in Kendal, and HK Gruber's Zeitstimmung conducted by James Macmillan. Plus another Shakespeare-inspired piece: Tchaikovsky's Romeo and Juliet Fantasy Overture. Stephen Johnson explores the inner workings of Dvorak's outwardly cheerful symphony. Orchestra: BBC Philharmonic. Conductor: Duncan Ward. Orchestra: BBC Philharmonic. Conductor: HK Gruber. Orchestra: BBC Philharmonic. Conductor: Günther Herbig. Performer: HK Gruber. Orchestra: BBC Philharmonic. Conductor: Sir James MacMillan. Orchestra: BBC Philharmonic. Conductor: Ben Gernon.